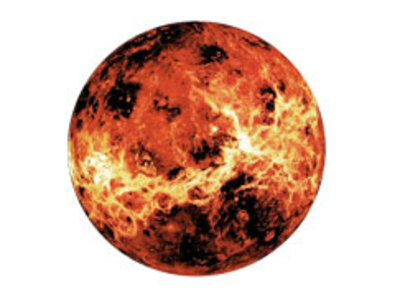 Because Venus is an inferior planet, from Earth it never appears to venture far from the Sun: its elongation reaches a maximum of 47.8Â°. Venus reaches its maximum brightness shortly before sunrise or shortly after sunset, for which reason it is often called the Morning Star or the Evening Star. 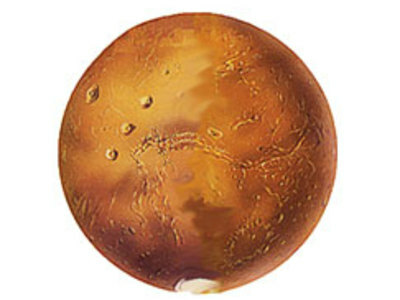 A terrestrial planet with a thin atmosphere, Mars has surface features reminiscent both of the impact craters of the Moon and the volcanoes, valleys, deserts and polar ice caps of Earth. It is the site of Olympus Mons, the highest known mountain in the solar system, and of Valles Marineris, the largest canyon.